Since She-Who-Worships-Pink was a baby she's suffered from dreadful eczema especially on her feet and hands. The doctor told us "cream her hands then cover them with cotton gloves at night, in extreme cases damp cotton." OK except for one thing: no one makes 'cotton' gloves for babies or even toddlers in fact anyone under the age of say 20. So I looked at the socks I had on her creamed feet and decided to cover her hands with another pair. But she wasn't having it. Socks are for feet NOT for hands. 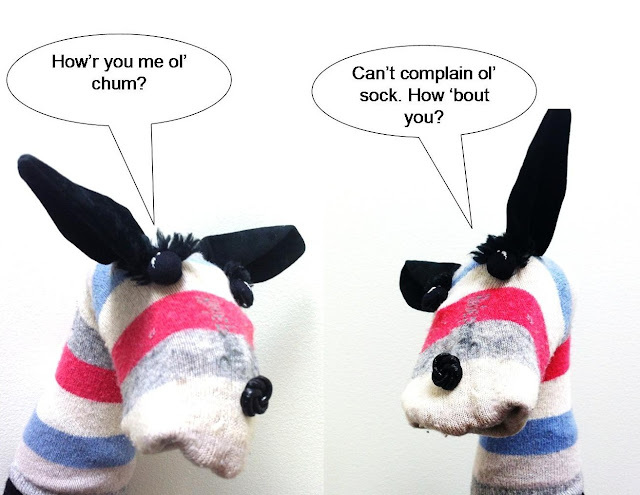 So this little dilemma hatched the puppet sock idea. And Lord knows with the speed at which her feet were growing I had plenty of outgrown ones to work with. Gather up your stuff: Scissors, needle and thread, a fine paint brush, eyes & maybe noses*, fabric paint and a fine paint brush. I bought packets of various sizes and kinds of eyes from Lincraft (a large craft store in case you're not familiar) There are sew on ones, press together ones (like those used for teddy bears) and glue-ons. You could also buy noses or just use old buttons. These eyes below (and their nose counterparts) are pushed through the fabric before attaching the back clip on the inside. But I prefer glue or sew on eye if they're for bedtime as the back of the clip can be scratchy. The last thing we want is more itching and scratching! In this case I've used sew on eyes which are very cheap and stay on in the wash (no worries about whether the glue will hold). Then just stitch away as you would a regular button. After your buttons are in place, take some spare fabric, or as I did, an old face-cloth and stuff the socks into more or less the shape you would have if there was a foot or hand inside. So they are the easy-peasy 15 minute sock puppets. He has stitched on ears I pulled off a Halloween black-cat hair-band (bought from the Two Dollar Shop) Self covered buttons for eyes which I embroidered with white thread and a button for a nose. I also tucked in the toe of the sock to make an opening mouth and tack stitched that at the corners to make it stay in. You can even see him in action here..
My next sock project is to turn a pair of old brown knee-high socks into giraffes using fabric scraps and some of the tan fabric paint I used above to make the giraffe spots.